For sale H&K 53 sbr new since conversion, Done by Terry Dyer on form 4 in Nebraska. It looks like it was converted from a new 93 Until I learn how to post pics please send your email address and I will send them to you. Dear Mel, you're asking for $4.5k for a HK53 SBR made by Terry Dyer. A NIB HK93 goes for close to $7K these days, so you're going to need to raise your asking price considerably if you want anyone to take you seriously. I've recently came across a Colt AR15 transferable for $15k tfrom a dealer, but without pics and a price that low, I'd rather walk. I just did not want to use photobucket if it could be done another way. The attachment button says it won't work for my account. Well I am a little confused. I would like to sell it. I thought $4500 that I had it priced at, would have brought someone to the table. But as Neo said if priced too low people will blow it off. I also do not want to give it away. What then would be a good price for both parties? I agree with x50plt. Your pricing is not that far off. You need pictures and a better description of how the 53 was "converted". Is it a real 53 barrel with the proper twist or is it the cut 93 barrel? Is it a correct 53 carrier group or is it a cut 93 carrier? How was the cocking tube addressed? On and on... Pictures and details will help get it sold quickly IMO. $4500 is a fair market value for this. The availability of high quality clone guns from MKE and others has lowered the value on original HK sear hosts by a fair bit. The value of an HK 93 + the cost of conversion is worth less than a HK53 host -- to say it another way, the whole is worth less than the sum of the parts. The reason is that people looking for full auto fire know they will burn up the host and would rather get a cheaper but quality clone. That also lets them get additional hosts. Example: the Zenith/MKE Z43 rifle, which is essentially an HK33 if you add a sear and a shoulder stock, lists at $1,600 (sells for less). I agree with x50plt. Your pricing is not that far off. You need pictures and a better description of how the 53 was "converted". 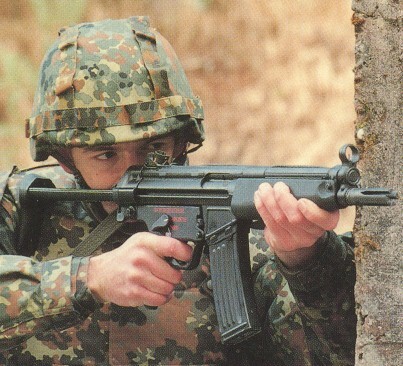 If it is genuine German and full auto ready it can bring close to $7k for the " collectors"... However if it is just for Shooting full auto ready... $4500 is fair...its all in the details. If I did not have two already I would buy it. The 53 is one of my favorite shooters. Yes, I am missing it. What point is that? Just that when top tier items are priced too low, people tend to think the deal is too good to be true. Sometimes pricing too far below market in order to sell fast can be counter productive. When the seller bumped his price, we were able to take his listing seriously, and so the gun moved/sold.